This 18k White Gold 10.09ct Antique Cushion Diamond Halo Engagement Ring is a total show stopper! Imagine this massive 10.09ct Antique Old Mine Cushion cut Diamond resting upon your finger! 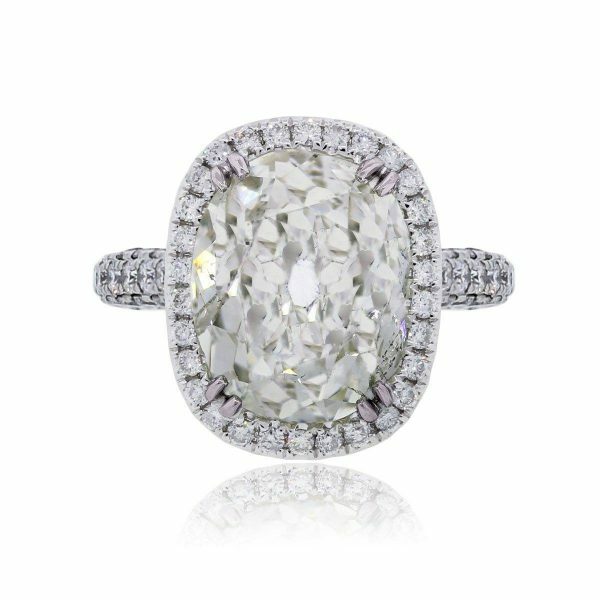 This Antique Cushion Diamond Halo features an old mine cut diamond. Back in the day, Diamond cutters fashioned diamonds with a large culet in the center which was said to allow more light to refract from the diamond. Today Old Mine cuts are hard to come across and have been sought as vintage, but still desirable to those who love the look of the this vintage fashioned diamond. Additional Details This Antique Style 10.09ct Old Mine Cut Diamond Engagement Ring is in Excellent Condition! The center diamond is an antique old mine cut, which is why the culet in the center is so large. Diamond cutters once thought that a larger culet would allow more light to refract from the diamond. Comes with a Raymond Lee Jewelers Presentation Box! Categories: Cushion Cut Engagement Rings, Diamond Engagement Rings, Diamond Jewelry, Diamond Rings, Diamonds, Engagement & Wedding | Raymond Lee Jewelers. Tags: antique cushion diamond ring, Diamond Engagement Ring, Diamond Halo Engagement Ring, old mine cushion cut diamond ring, white gold diamond engagement ring.